Vasilopita chair Dionysia Hahn, BLE president Irene Savas, Consul General Stratos Efthymiou, Father Konstantinos Manetas and GAPC vice president George Kopelas sing kalanta. Photo credit Sophia Koustas. On January 13th, over 200 guests gathered at the Greek-American Political Club in Cambridge for Vasilopita, the kopi pitas or cutting of vasilopita (traditional New Year’s bread), an annual event co-hosted by the Boston Lykeion Ellinidon and the GAPC. Vasilopita, or St. Basil’s bread, is baked and ceremonially sliced by Greek families and community organizations on or around New Year’s Day as a way to ensure good luck for the coming year. 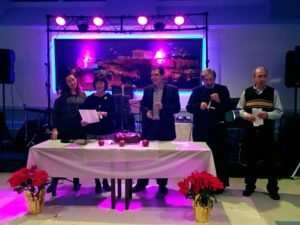 The BLE and GAPC have co-hosted Vasilopita since 2008, bringing together the membership of both organizations for a celebration of Greek New Year’s traditions, from the sharing of vasilopita to the singing of New Year’s carols called kalanta. After smashing a pomegranate for good luck – another unique Greek tradition – the new year was symbolically welcomed by Consul General of Greece in Boston Stratos Efthymiou, BLE president Irene Savas, GAPC vice president George Kopelas, and Father Konstantinos Manetas of the Dormition of the Virgin Mary Greek Orthodox Church in Somerville. Eventgoers enjoy live music at Vasilopita 2018. Photo credit Sophia Koustas. Music was provided by Artemis Kourouzidou, Kostas Haloulakos, George Kokoras and Thanos Papadopoulos. 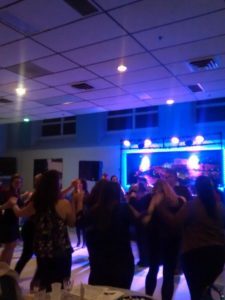 “There was dancing and kefi late into the evening…and early the next day!” noted Dionysia Hahn, chair of the event. The crowd enjoyed eight vasilopitas baked by BLE members, each one with a coin baked inside for a lucky winner. Local businesses A4cade by Area Four and Thunder Road Club donated raffle prizes, as did BLE supporters Claire Aliki Collins, Dawn Georgiadis, Andrea Messina and Katerina Swartz. The BLE hosts open dance practices at the GAPC twice weekly, on Wednesday evenings and Saturday afternoons. The organization’s next event, Karnavali, will be held at Dormition of the Virgin Mary Greek Orthodox Church on February 10th.